Parks and gardens? Really? Surely it’s all about landmarks and outlet malls? Well, no. As it turns out, a mulberry tree can be just as appealing as a Mulberry handbag. Venturing outdoors to the countryside, to see elegant botanical gardens and unrivalled displays of natural beauty, is becoming a very popular Chinese travel trend. It provides a change of scenery from world-famous landmarks that lure droves of tourists annually, while still allowing visitors to experience a country’s unique culture and natural environment. This article aims to uncover the rising appeal of outdoor, rural, and natural spaces among Chinese travellers, exploring why it has become a trend, and highlighting the need for tour operators to introduce outdoor-themed itineraries. Many of China’s cities are notorious for being the most polluted spaces on our planet. Beijing is infamous for its air pollution – the thick smog poses long term health risks to its citizens, and data claimed breathing its air for a day was more harmful than smoking forty cigarettes a day. When we ask our office in Beijing about the weather, the response often includes the ‘red light’ on the air quality monitors in everyone’s apartments. And it’s not just Beijing. Shanghai and Guangzhou, China’s trade and manufacturing hubs, have recently recorded higher levels of air pollution than the capital. This has prompted the Cordis Hongqiao, a newly opened luxury hotel in Shanghai, to boast its superior ‘air filtration’ system as a luxury feature. This is an attractive offering to its Chinese guests; each room is fitted with pollution monitors and sealed double-glazed windows to contain the fresh air indoors. Perhaps this constant exposure to polluted air encourages citizens of Chinese cities to escape to the countryside when given the opportunity. Indeed, rural tourism has witnessed sharp growth in the past few years; around 2.1 billion trips were made to the Chinese countryside in 2016, creating jobs for 6.72 million rural people. In 2017, China’s government invested $550 billion yuan into the development of rural tourism, as they expect it will help alleviate poverty and boost economic growth. This investment will provide better tourist services for travellers, but it will also consolidate rural tourism as a key preference for overseas travel. Furthermore, China’s forest tourism industry has witnessed staggering growth in recent years. In 2017, around 1.39 billion trips were made to China’s forests and wetland parks, comprising of 28% of trips made in China that year. The industry, worth 61.8 billion in 2012, saw a rise in revenue to 140 billion in 2017. Clearly, more Chinese travellers are seeing the value in visiting areas of outstanding natural beauty. One incentive for countryside escape is to see beautiful flowers. There are many ‘flower tours’ held throughout China every year, especially in the Yunnan, Guangdong, and Sichuan provinces. The idyllic countryside village of Huangling recently celebrated the one-year anniversary of its Flower Town program. This floral-themed experience, which provides visitors with scenic views of rapeseed flowers and peach blossoms, alongside flower tours and other cultural events, attracted 200,000 people globally in April and May 2017, an increase of 67% from the previous year. Evidently, escaping to the countryside is a popular travel trend. The passion for the great outdoors among Chinese travellers extends beyond their own country, with many tourists travelling abroad to witness world-famous displays of natural beauty. Jing Travel recently interviewed Cai Wanza, a popular Chinese garden traveller who organises “world garden tours” and promotes “the garden lifestyle” in books and on social media. In 2018, Ms. Cai added routes covering California, France, Switzerland, New Zealand, and the Maldives to her garden tour themed itineraries. Indeed, Ms. Cai’s garden tours give Chinese travellers the opportunity to see more of a destination they initially didn’t take seriously. While many Chinese travellers would stop off in Belgium for only a day or so before transferring, on Ms. Cai’s garden tour, the group spend fourteen days there since it has 200-plus private gardens. Other Chinese social media influencers and KOLs have made their name through their enthusiasm for gardens and flowers. DACAI (@大菜微博), a popular food and floral travel blogger, has over 700,000 followers on Weibo, and according to Jing Travel, the second-most popular question posted on Mafengwo’s forum in 2017 was “What places in China can you recommend for roaming through a sea of flowers?”. Chinese tourists are becoming more interested in travelling around Europe to see gardens and flowers. An article on the UK’s “most popular lavender fields” was recently published on Red Scarf (Honglingjin), a lifestyle website targeting young Chinese people living in the UK, and has over 180,000 views (as of June 2018). The article features lavender farms in Yorkshire, Somerset, and the Cotswolds – places renowned for their stunning natural beauty. Isparta in western Turkey, known as the ‘Land of Roses’, welcomes thousands of tourists to its annual harvests. According to the Culture and Tourism Provincial Director, Osman Çot, the rose gardens have become an “attraction center” for tourists, with most of them coming from the Far East. While flower and garden travel may not yet be as popular as sightseeing, it does support the narrative of Chinese travellers seeking unique experiences offered only by outbound destinations. Thus, tour operators should begin to have a more open mind and monitor developments in this trend to determine if it’s worthwhile introducing more garden product. As Ms. Cai said herself, “if tourism officials assume Chinese are not interested in their gardens, they miss a big opportunity”. Attractions in the great outdoors or in the countryside appear to rank highly on China’s influential review sites. Two of the top five attractions in the Netherlands, according to Mafengwo, are the historic neighbourhood of Zaanse Schans, known for its traditionally Dutch houses and windmills, and Keukenhof botanical gardens, among the world’s largest flower gardens. They respectively have 355 and 245 reviews on the platform. Mafengwo’s listings for the most popular attractions in Germany also shed light on this trend. Ranked first is Neuschwanstein Castle, a 19th century palace overlooking vast areas of greenery and quaint Bavarian villages from its hilltop, which currently has 746 reviews. The runner-up is Königsee, an alpine lake in the heart of the countryside, with 288 reviews. Obviously, these destinations have had a huge impact on Chinese travellers, with many commenters describing the attraction for unassuming travellers, sharing advice on the best times to visit, and recommending other places to explore nearby. Many destinations attracting Chinese tourists can attribute their success to the great outdoors. One such example is New Zealand – known for its vast landscapes of greenery, it has been attracting Chinese tourists for years to its outdoor adventure activities. The Antipodean Explorer, dubbed the “world’s best moving hotel”, is a new venture aiming to attract luxury-oriented Chinese travellers. It transports them between Auckland and Queenstown, past New Zealand’s beautiful landscapes. 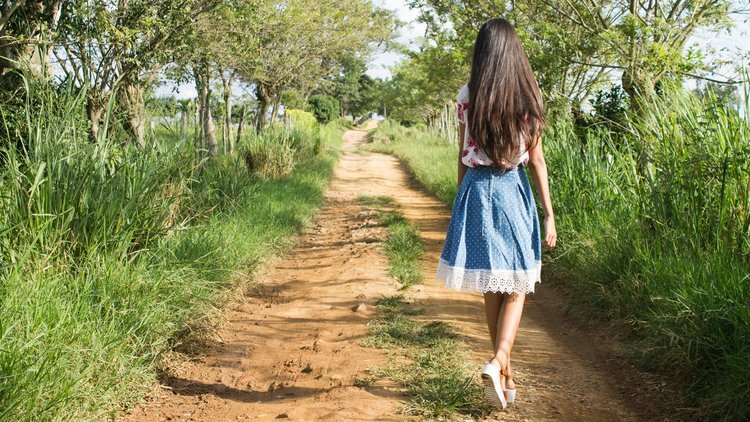 Some destination marketing organisations are beginning to realise the potential of promoting the ‘escape to the countryside’ theme to Chinese tourists. Recently, a China Readiness workshop was hosted by I Love NY state tourism and the Sullivan Catskills Visitors Association (SCVA) to improve understanding of Chinese traveller’s needs to 50 representatives of local businesses. SCVA represents the Catskills Mountains, a scenic country getaway located 90 minutes from New York City. In delivering overviews of the difference between the domestic and Chinese tourism markets, and how to effectively use WeChat to market destinations to Chinese travellers, this workshop encouraged local businesses to embrace change and begin to “think globally”. Speaking of ‘thinking globally’, we’ve done a fair amount of work to promote UK botanical gardens in the Chinese travel market. Back in March, we took Kew Gardens on a sales mission to Beijing, arranging meetings with key tour operators, including Ctrip and Caissa Touristic, to sell the Kew Gardens product. 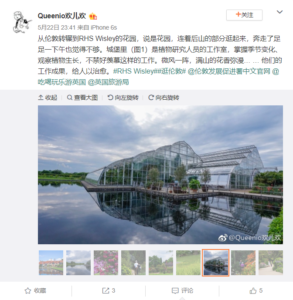 In May, we also arranged a visit to the beautiful RHS Wisley Garden for the influential Chinese travel blogger, Liu Huan (Queenio欢儿欢), who took stunning photographs of the gardens and displays for her followers to enjoy. It seems as if there is a subsection of Chinese tourists who travel both domestically and abroad to see the countryside, picturesque gardens, and rural towns. There is evident demand here, and since many tour operators assume Chinese tourists only want to see a country’s must-see attractions, the forward-thinking have an opportunity to step in and make some hay whilst the sun is shining.